One of my favorite cookbooks is Ottolenghi: The Cookbook. The photos are gorgeous and artsy, depicting what seems like just my type of place. Big plates piled high with colorful salads and vegetables, a variety of beautiful meat dishes, and pastries and cookies (with lots of nuts) teasing you from a big glass storefront window. However, what I like best about the photography is how it unites the people and the food, exactly how Italian-Israeli Yotam Ottolenghi and Palestinian Sami Tamimi describe their food. Every recipe relates to people in their lives, whether the various recipe-creaters at Ottolenghi itself or their family members (incidentally mostly women) who inspired the Middle Eastern bent that permeates their creations. In the background of a shot focused upon the pastry plates, you see a mother making her baby giggle in a stroller as they both enjoy a snack and a warm drink out on the sidewalk table. Kids, dogs, mothers, lovers. Had I not read the stories of Ottolenghi and Tamimi, who came together in London after growing up on opposite sides of the Jerusalem, the message was still clear; great food is what brings people together to enjoy the beautiful mundanities of life. I’ve never been to Ottolenghi, but I am certain that if (when!) I visit London again I will be unable to walk down the street without making a serious food detour into their store. The first thing I will order will be their Cauliflower and Cumin Fritters with Lime Yogurt. 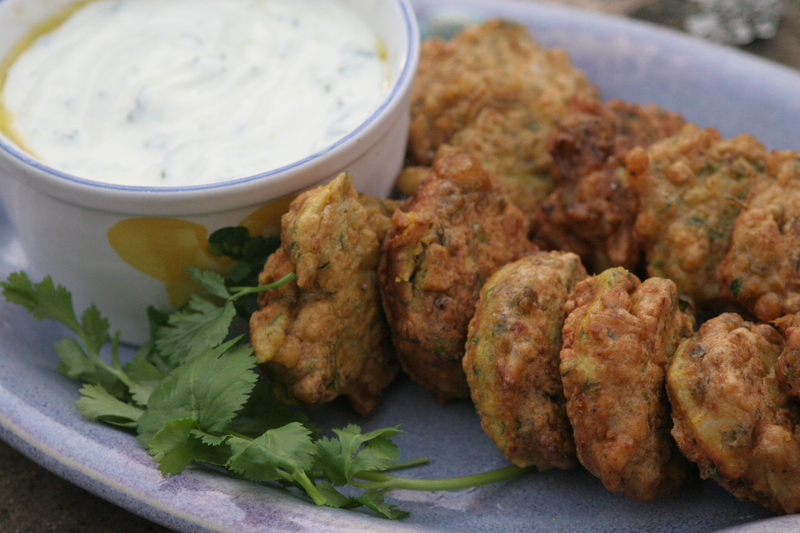 I have made many recipes from their book and the Cauliflower Fritter Recipe is a game-ender. Whenever I make them, people cannot guess their ingredients. They have a mysterious, Middle-Eastern spice mix that most people never try out with cauliflower. I always have these spice on hand, and I grow parsley and cilantro in my garden so I am usually set for the seasoning. I almost always have yogurt in the house because our house goes through at least a quart a week. Eggs, flour, shallots? Great. All you really need to do is pre-cook the cauliflower florets in salted water and drain them. (As I have mentioned elsewhere, don’t forget to use the tasty stem too.) As they cool, you simply whisk everything else together. Add the cauliflower and mash it up a little bit with the whisk. One of my tricks with these is that I prefer to make them much smaller than the recipe recommends. I actually use a tiny little cookie scooper to get uniformity in size and drop the balls of batter into the oil really quickly. My favorite falafel place in San Francisco does something similar at a breakneck speed so I tried it the first time I made these. It makes your work clean(er) and fast. Whatever you do, please eat these with people you love and enjoy the special simple things in life. 1.Make the Yogurt-Lime Sauce. 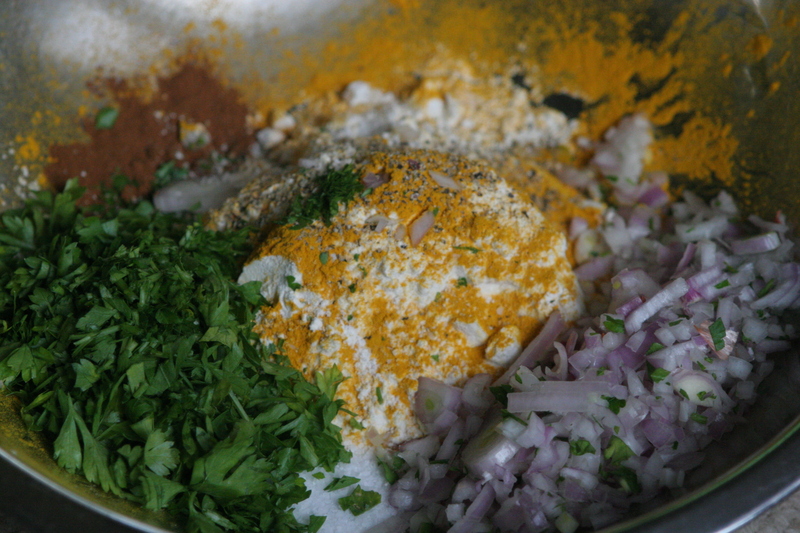 Whisk all the sauce ingredients together. 2. Boil salted water and add cauliflower. Cook about 8 minutes or until it is very soft. Drain and set aside to cool a little bit. 3. Heat frying oil of choice in a high-heat frying pan (I use cast iron for this) to medium or medium low. I fill it up about 1/2 inch to 3/4 inch up the sides of the pan. 3. Mix everything except the eggs and cauliflower. Whisk in the eggs and then whisk in the cauliflower. 4. With a tablespoon or a small cookie scooper, gently drop balls of the batter into the hot oil, taking care not to overcrowd them. 5. After about 3 or 4 minutes, flip them carefully with a fork to cook on the other side. They should be cooked through with no raw ingredients. 6. Serve immediately with the yogurt sauce or, as Sami suggests, on a picnic in pita with hummus and tomato. 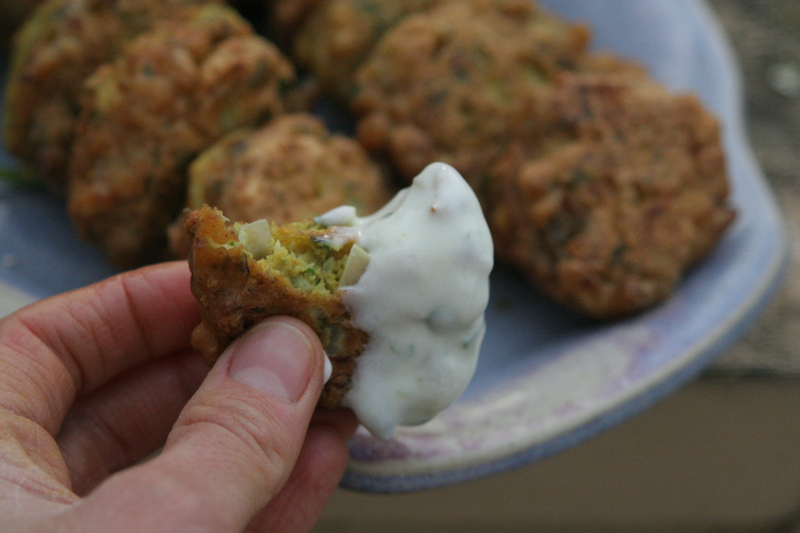 This entry was posted in Cauliflower, Dinner, Lunch and tagged Cauliflower Cumin Fritters, Delicious Cauliflower Fritters, Ottolenghi recipe, Yogurt Lime Sauce. Bookmark the permalink. Your pictures and descriptions are as wonderful as your recipes! Yum. Just comes to confirm my deep-held Eastern European belief that anything rolled in eggs and flour, fried for a bit, then dipped in yogurt cannot but be delightful. 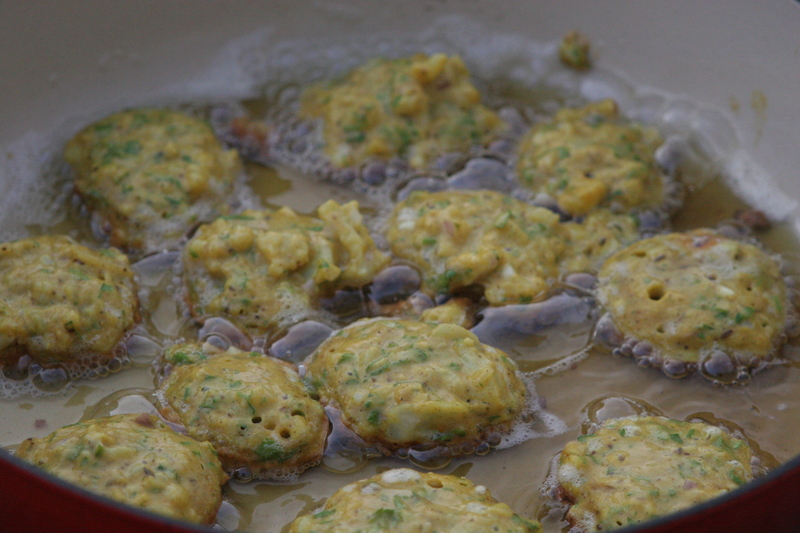 I can attest that these fritters disappear faster than you can fry them! Yum! Ellie, I agree. And I’m eating sheep milk yogurt as I type this. Nom, nom. there are two different flour ingredients and measurements – can you clarify? How odd. I’ve just changed the recipe. Thanks for bringing it to my attention. These look delicious. Sunrise is the absolute best! I haven´t been there in ages (I now live outside of the country) but when I was a kid we would buy a big sack with my mom and it almost never made it (the 5 minute car ride) home. Thanks Eva. I make a lot of versions of these. Zucchini are delicious too so long as you salt and squeeze out some of the water when you shred them.